Whenever you install a new application on your computer, you have to make sure that it does not come with additional side effects like Ads by Lights Cinema. 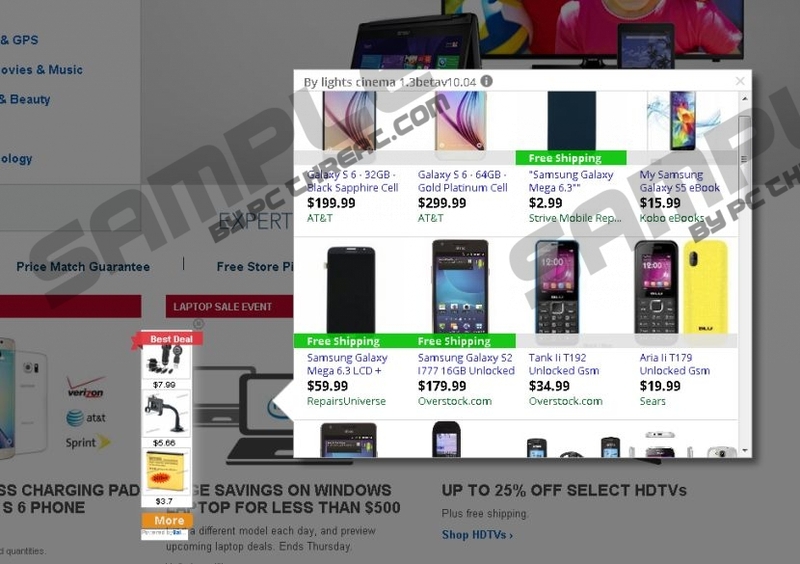 These commercial advertisements will appear on your screen when you access online shopping sites. They are both annoying and potentially dangerous, so if you need to remove Ads by Lights Cinema as soon as possible. As you can probably tell, these pop-up ads are generated by an adware application, so in order to terminate Ads by Lights Cinema, you have to get rid of the adware program responsible first. The adware program that generates Ads by Lights Cinema is (obviously) called Lights Cinema. This application is based on the CrossRider engine, and it adds extensions to the Internet Explorer and Mozilla Firefox web browsers. The program itself is just another clone of Cinema Now, Cinema-Plus, Movie Mode, and many other similar applications. While some programs from this group have official websites, Lights Cinema does not, so it means that users download this application in a software package, together with other freeware apps that are available for download at third-party sources. It is very likely that you did not even know you were about to install Lights Cinema when you downloaded some program from a file sharing (or a torrent) website. In order to avoid installing Ads by Lights Cinema and everything related to it, you should read all the installation wizards carefully. Usually, such adware programs inform users that additional applications are about to be set up on your computer. If you breeze through the installation process, it is only natural that you do not notice any message, but please do keep in mind that it is possible to prevent Ads by Lights Cinema from entering your system. Apart from installing the adware application itself, Light Cinema might also come with various adware helpers that allow it to collect data on your web browsing habits and then display Ads by Lights Cinema when you browse online stores. Although the program itself is supposed to turn your online video watching into cinema session experience, the side effects of this application are far more pronounce. Namely, Ads by Lights Cinema will flood your screen, and you will not be able to browse the Internet properly. You must remove Ads by Lights Cinema from your computer because there is a good chance that the ads could be exploited by cyber criminals to distribute corrupted content. At the same time, you must delete all the other unwanted and dangerous applications that Lights Cinema might have arrived with. Scan your computer with a licensed antispyware tool to determine what programs must be removed, and get rid of them at once. When the Charm bar appears click Settings and select Control Panel. Open Uninstall a program and remove Lights Cinema. Go to Uninstall a program and remove Lights Cinema. Select Add or remove programs and uninstall Lights Cinema. Quick & tested solution for Ads by Lights Cinema removal.